The bulky, neckless body and upright posture of this bird look good for a raptor of some kind. We know this is a diurnal bird of prey and not an owl by the small head, lack of "horns", and eyes that are on the side of the head. Of the diurnal birds of prey, kites, vultures, Osprey, falcons, Northern Harrier, and eagles can be eliminated by the reddish barring on the underparts. Adult Sharp-shinned and Cooper's Hawks do have reddish barring on the underparts, but also have gray backs and unmarked gray (Sharp-shinned) or black (Cooper's) crowns. The crown of our quiz bird is reddish with fine dark streaks. Of the buteos, an intermediate morph Swainson's Hawk would show some reddish barring on the lower underparts but would also have a solid dark bib or at least a clear, unmarked breast. Some light morph adult Rough-legged Hawks can show extensive barring below but this barring isn't reddish like our quiz bird. A light morph Red-tailed Hawk would show a dark belly band contrasting with a whitish breast. Light morph adult Ferruginous Hawks do have reddish barring on the underparts but this barring is restricted to the leg feathers and lower belly. How about an adult Broad-winged Hawk? Broad-winged Hawk lacks the white spotting on the wings shown by our quiz bird (just visible at the bottom of the photo below the large branch). 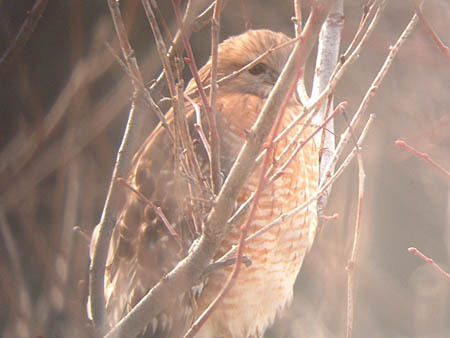 This spotting is however found on adult Red-shouldered Hawks and that's what this bird is. This adult Red-shouldered Hawk was photographed on February 6, 2006 in northern Cook County, Illinois.